After a long friendship with “The-Zone” crew here is a shows of 4 truly monstrous tracks. Perfect style of dark creepy techno. Slow, heavy and hypnotic! Minimal blends with Techno in all 4 tracks of this EP. 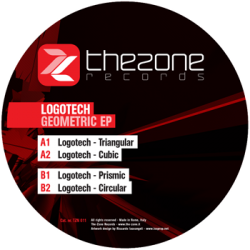 Industrial pads melt with hypontic ones, deep basses with powerful rhythmics that all together form something he himself called “Ride Groove” emphasising this with the name of the ep itself “Geometric” also highlighting the historical connection between music and mathematics. Listening to “Triangular” and “Cubic” on side A you are pulled into a spatial and hypnotic sensation while the powerful rhythms of “Circular” and “Prismic” of side B are powerful dancefloor killers. Another big techno release for The Zone Records!